For outgoing Metcom director Gina Audritsh, retirement isn't so much the closing of a book, but the end of a chapter. A longtime Hubbard resident, Audritsh wrapped up her career at the Woodburn-based emergency dispatch center with a retirement party on Wednesday, Jan. 16, as dozens of friends, loved ones and co-workers sent her off nearly 30 years to the day from her first shift on Jan. 10, 1989. "I wanted to go out at 30, because I wanted to go out on a high note," Audritsh said. "It's been a great ride for me. I absolutely have no regrets." Audritsh began her career just two years after graduating high school, moving to Woodburn from Salem to begin work at a dispatch center that served just five agencies on her first day and 25 agencies on her last day. She took the position after her husband, James — former police explorer with Woodburn when in high school — suggested she look into a career as a police officer. Audritsh became a cadet and went into training, working traffic control at parades, going on ride-alongs with officers. But while she wanted to make a living in public service, Audritsh didn't enjoy the prospect of being out on the front lines of public safety. It wasn't long after, though, that the cadet program landed her at a dispatch center in Salem, and she knew that was where she wanted to be. "I was hooked instantly," Audritsh said. "As soon as I saw a job opening, I applied. That was my first hire, and really my only hire. I knew from the time I got hired, that it would be a long term career for me, that I wanted to do it forever." Audritsh and her husband soon moved to Hubbard where they bought their first house and have been there ever since, raising two daughters — Andrea and Miranda — through the North Marion School District. Through the first 10 years of her career, Audritsh served a variety of roles, starting as a dispatcher before moving into a new role training dispatchers, and eventually becoming a supervisor. It was difficult. Working as a dispatcher meant that Audritsh was the first contact for many people seeking emergency services. Despite the high pressure and stress of taking daily emergency calls, Audritsh enjoyed the position, knowing she was helping others who were often desperately in need. "I think it's cliché that you just want to make a difference and help people, but that's what it really was," she said. "Having an opportunity to be on the phone when people are having their worst crisis, you need someone who is calm on the other side of the phone and who can be an advocate and be a resource." 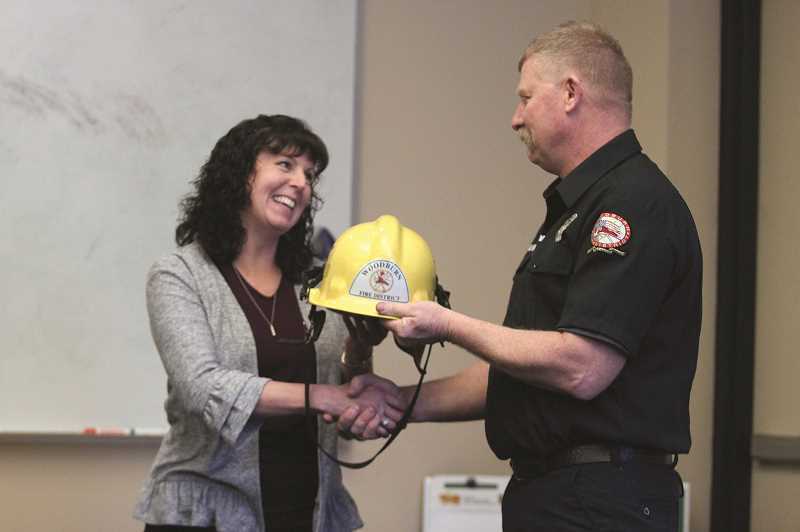 Over the course of her career, Audritsh made a number of long-term working relationships with first responders working for Woodburn and the surrounding region, many of whom were on hand to pay their respects at her retirement party. "Gina was always my favorite dispatcher," Woodburn firefighter Robb Gramzow said. "GIna as a dispatcher and a person — she had the ability to dispatch for you and build a box on the run, and for police that's not nearly as important as it is for us, where we could ask for stuff and they could go find it." In 1999, Audritsh hit two milestones. She began a second career working real estate at Hallmark Properties for her husband's uncle — Dave Christoff. Soon after, she was promoted to the director of the 911 center. As director, she helped the dispatch center grow by consolidating nearby agencies into the call center. In 2003, the dispatch center consolidated with agencies in Silver Falls and became Norcom. Eight years later, she began working with two call centers in Stayton and merged them with Norcom in 2013, becoming the Marion Area Multi-Agency Emergency Telecommunications, or Metcom 911 for short. With her 30th year coming to a close, Audritsh is ready to hand the reins off to the next director, Mark Spross, and focus more of her attention on real estate. "I've pretty much been doing friends and family over the last 20 years," Audritsh said. "Now I'm going to expand my business, and eventually Dave wants me to take over as the principal broker." And with a lifetime of friends, family and personal connections in Woodburn, Hubbard and northern Marion County, Audritsh will continue to be actively involved in the community in a variety of ways. "We don't really plan on leaving the area," she said, laughing.